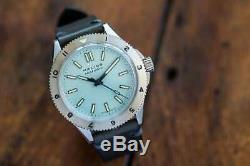 For sale is a like new Halios Seaforth Series III with Pastel blue dial and 12 hour GMT Bezel with no date. Watch is in great condition with some very light scratches on the lugs. The Seaforth Series III uses the Swiss ETA 2824-2 self-winding movement with a 40 hour power reserve. 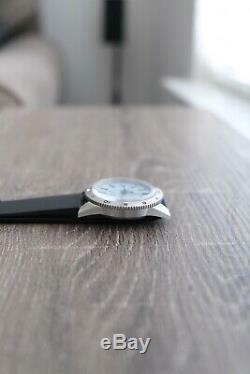 Light Blue Halios canvas strap. 2 Halios signed buckles for the straps. Halios signed leather travel pouch. FINISH: Brushed with polished lug chamfer. 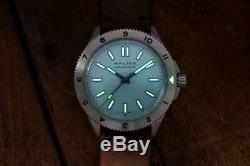 DIAMETER: 40mm (fixed bezel); 41mm (rotating bezel). ROTATING BEZEL: 120 clicks, unidirectional. 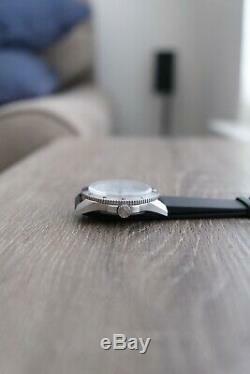 CALIBRE: ETA 2824-2 self-winding movement. 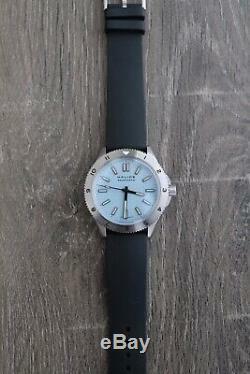 The item "RARE Halios Seaforth Series III Pastel Blue GMT 12 Hour Bezel No Date" is in sale since Thursday, March 14, 2019. This item is in the category "Jewelry & Watches\Watches, Parts & Accessories\Wristwatches". The seller is "ssa604" and is located in Blaine, Washington. This item can be shipped to United States.